Posted: Mon Jan 24, 2011 12:53 am Post subject: FAQ: How can I hook a microscope objective to my camera? 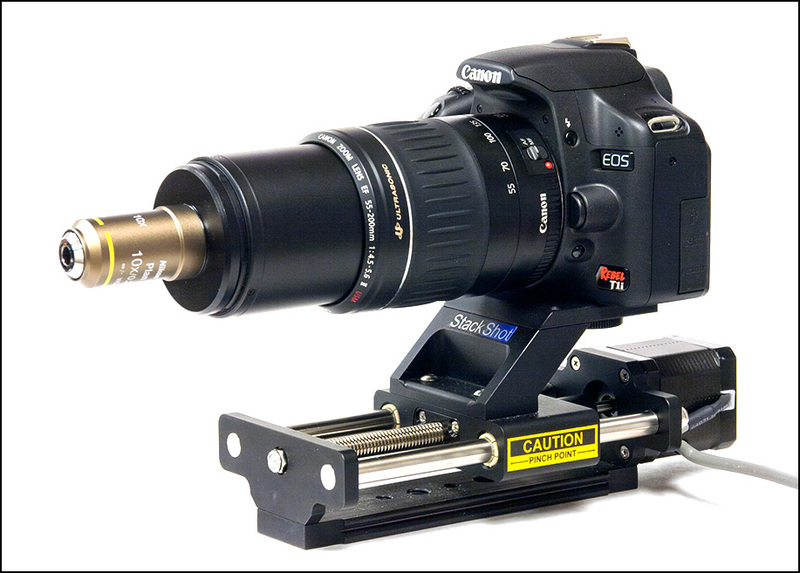 How do I hook a microscope objective to my camera so I can shoot at 5X and above? 1. Get an old-style "finite" objective that has sufficiently small chromatic aberration, and stick it on tubes or bellows to get the appropriate extension. 2. 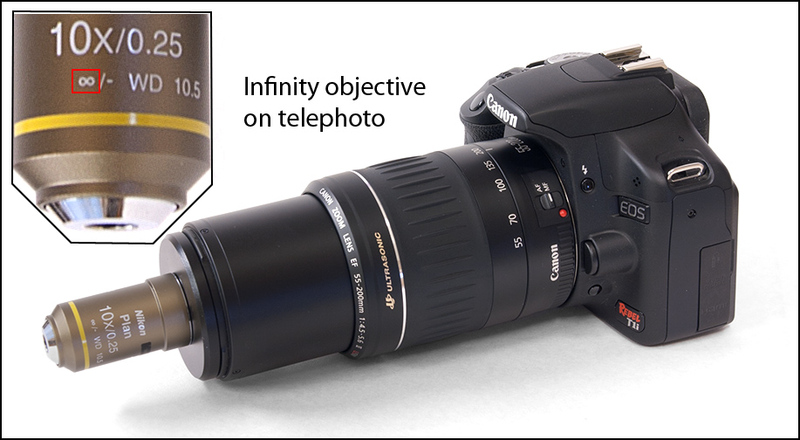 Get a new-style "infinite" objective that has sufficiently small chromatic aberration, and stick it in front of an appropriately long "tube lens" such as a telephoto lens focused at infinity. Notice that I've emphasized the issue of chromatic aberration. Most of the older "finite" objectives and some of the newer "infinite" objectives are specifically designed to have quite a bit of chromatic aberration that is expected to be canceled out by a "correcting eyepiece" or other optics that have just the right amount of opposite aberration. When an objective like that is used by itself, or with other optics that are not matched to it, the result can be some pretty extreme color fringes. Certain lines of objectives are known to be good by themselves. Using an unknown objective is like rolling the dice -- maybe it works, maybe it doesn't. When in doubt, post a request in the Equipment forum to see if anybody knows about the objective you're interested in. OK, with that main caution out of the way, let's forge ahead. Here are some pictures that illustrate the major components and strategies. First, the classic approach of sticking a finite objective on extension. Shown below is the Nikon CF N Plan Achromat 10X NA 0.30 objective, which is designed to be used on a microscope with 160 mm tube length, and with 0.17 mm cover glass. 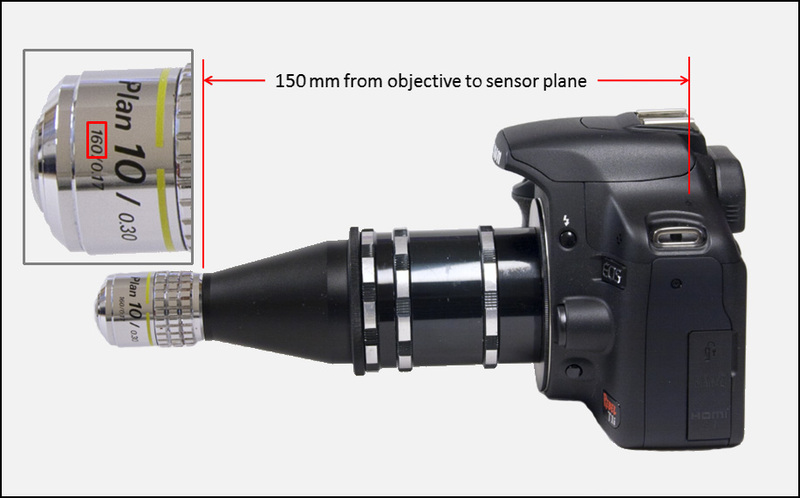 The "160" designation actually corresponds to 150 mm from the objective to the sensor plane, and despite its specification, this objective works very well with no cover glass. 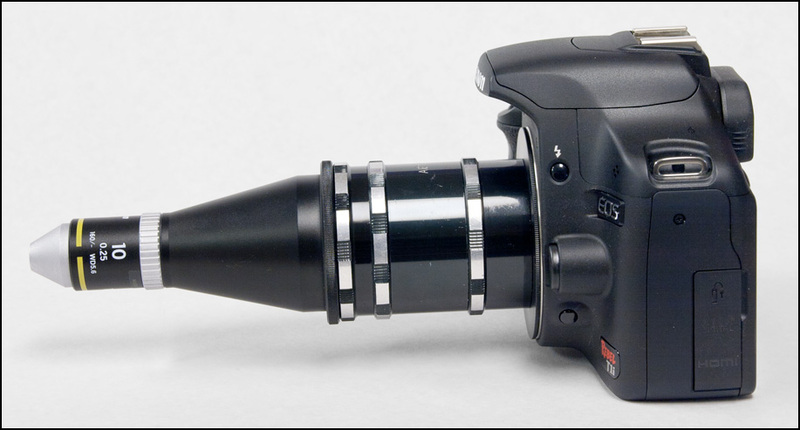 D: A "chipped" adapter that accepts M42x1 threaded optics on the lens side, and presents an interface to the camera that looks like a modern lens. This type of adapter "plays nicely" with the camera, so that all of its fancy metering modes including automatic flash will work properly. Using a purely mechanical adapter, without the chip, you may be limited to manual exposure with trial-and-error settings. This particular objective (the CF N Plan Achromat 10X NA 0.30) delivers an excellent image over a 1.6 crop-factor sensor when used at 10X magnification with its rated 150 mm extension. It can also be extended beyond 150 mm to produce higher magnifications. However, it does not work well on shorter extensions because the corners develop severe astigmatism. Some other lenses sacrifice a little resolution but are more tolerant of reduced magnification. One of those is the Nikon Finite Conjugate 10X objective listed by Edmund Optics. Here is that objective on 150 mm extension. Remove the extra tubes to reduce it to about 7X magnification. Note that other objectives require different adapters and/or different extensions. Here is a Nikon CF M Plan 20X objective that is designed for use with a 210 mm tube and therefore works best with 200 mm extension. The Nikon CFI Plan Achromat 10X NA 0.25 objective has proved to be an excellent lens for this purpose. It delivers its rated magnification when used with a 200 mm telephoto or other tube lens, and it has been shown able to cover a full-frame sensor (36mm x 24mm) with high quality image when used with an appropriately wide telephoto. 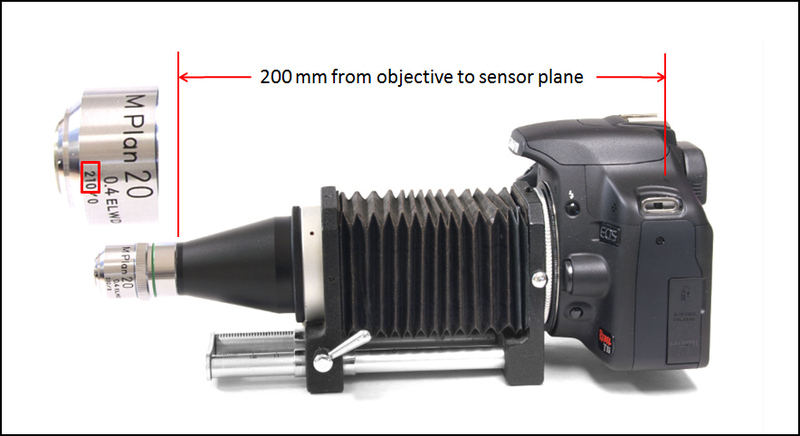 With an APS-sized sensor, this objective can also be pushed down to as low as 5X, by using rear lenses as short as 100 mm. Note that there are no extension tubes in this setup. What may look like a tube is just the front section of the telephoto lens, which is zoomed out to its maximum length of 200 mm. On smaller sensors, the objective can also be used with shorter tube lenses to give correspondingly lower magnifications. Here is an example using it in conjunction with an ancient 135 mm f/3.5 preset aperture telephoto, coupled to the camera with an M42x1 chipped adapter. This lens happens to have a 49 mm filter thread, so a 49 mm to 52 mm step-up ring is used to mate with the 52 mm adapter that fits the objective. Note that in all these cases -- finite and infinite alike -- you have essentially no control over the aperture of the objective. The finite configurations simply do not have an adjustable aperture. In the infinity configurations, you can stop down the telephoto, but this will simply cause vignetting rather than increased DOF as you might expect. Due to the high magnification and the wide aperture, microscope objectives give very shallow DOF -- typically around 0.01 mm for a 10X objective. As a result, most successful uses involve focus stacking, typically with a screw-driven rail or microscope focus block to provide small focus steps. It is always challenging to avoid motion blur due to camera vibration at high magnifications. Standard advice is to use flash, preferably with mirror lockup and second-curtain sync in a darkened room with a couple of seconds exposure time. It helps to use a powerful flash close to the subject, to take advantage of the ultra-short flash durations provided by modern consumer-grade flashes operating at much less than their rated output. If you have a Canon DSLR that supports LiveView with electronic first shutter curtain (EFSC), and you have a quiet environment, then you may also be able to use continuous illumination. Edit: improve explanation of "tube lens". Edit: add description of adapter for infinite objective to tube lens. Edit: to clarify no extension tubes used with the telephoto. a infinite can be used in the first set up too..correct? No, finites and infinites cannot be swapped. You'll get an image, but it will have degraded contrast and resolution. Rik, a very clear and well illustrated introduction. In view of the first question in the thread, I wonder if its worth emphasizing that infinite objectives MUST have a tube lens and that finite objectives MUST NOT have one. I wonder about stating that the required extension for finite objectives is always tube length -10mm. (This is alluded to in passing for one common tube length, and then again for the other common tube length, so maybe this is not needed). The influence of working distance on objective selection might perhaps be mentioned also? Overall this is an excellent FAQ entry (and had it existed when I joined, it would really have helped me). This thread belongs here. I've linked to it so many times that it will be good to find a home for it. In addition to Chris Lilley's comments regarding WD (working distance), we should also mention differences in objective thread sizes and currently available commercial adapters offered at fair and reasonable prices. Oh - for people using camera systems other than Canon, it may be worth clarifying the advice about 'chipped' adapters. My understanding is that for Canon DSLR, without a chipped adapter there is no metering (and no focus confirm either). For Nikon DSLR, the lower end cameras need a chipped adapter for metering. The higher end cameras can also use a mechanical linkage (aperture indexing, AI) and still get metering (centre weight or spot) in manual and in aperture priority modes. 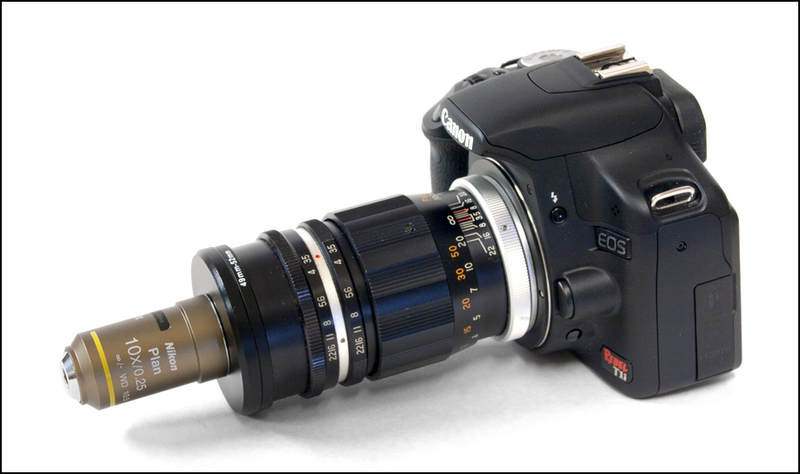 So for example an older AI or AIS 200mm Nikkor lens can be used as a tube lens, and will meter on the higher-end bodies despite having no electronic contacts. However, if the lens or adapter is chipped, then colour matrix metering can also be used. All Nikon DSLR give focus confirmation whether there is a chip, or mechanical linkage, or no linkage at all. I understand that for Pentax DSLR, metering is available for 'A' lenses and adapters which have electronic contacts. I don't know the equivalent facts for Sony DSLR. Note that in all these cases -- finite and infinite alike -- you have no essentially no control over the aperture of the objective. The finite configurations simply do not have an adjustable aperture. It may be worth adding that this is okay, and the objectives are designed to be used wide open like that on a microscope. In other words, clarifying that this is not a problem and that trying to add an iris to an objective is not a worthwhile exercise. is the infinite the way to go? Thanks for sorting this out, Rik. raise in price on fleabay for 2nd hand Nikon CF's and it's almost impossible to get your hands on one in Europe. Are there other CA corrected micro-objectives which perform as well as the Nikon CF without breaking the bank? Thanks for the feedback and suggestions, guys. Keep 'em coming in. I'll let this sit for a day or two to collect more info, and then I'll clean up the FAQ, remove what by then will be outdated comments, and we can repeat the exercise until we get a good reference version. SONYNUT, see http://www.photomacrography.net/forum/viewtopic.php?p=59673#59673. It's true that low mag, low NA objectives like 4X NA 0.10 can be swapped around without much degradation, but even at 10X there's a significant hit in quality. Since the major purpose of using an objective in the first place is higher quality than you can get with an ordinary lens reversed on bellows, losing that quality in a mismatch is not a good idea. I don't use chipped ones. With a chipped adapter you only gain focus confirmation (but not with the small effective NAs we use un high magnification macro) and some light metering modes like spot (not sure about the last tip). If I was going to buy a new adapter I would go for a chipped one, but I don't really need it. Rick, congratulations, I can't imagine a more clear explanation. Dou did it again!. Now we only will need to link this FAQ in place of repeat the explanations. Impressive piece of work Rik. From memory... I used to use a non-chipped adapter with my Canon 300D. The basic metering worked fine, but ETTL flash did not. (This aspect caused several new flash units to be returned as unsuitable for my purposes.) When I upgraded to the T1i, I was surprised to find that LiveView presented some additional odd behaviors, for example with LiveView showing a preview image that was several f-stops darker than the real exposure would be. After I upgraded to a chipped adapter, such problems no longer call themselves to my attention. So I'm pretty sure that least with the T1i there is more to the chipped adapter than AF confirmation. I'll check this aspect before finalizing the FAQ. From an economic standpoint, it's no big deal since the chipped adapter for Canon cost me only $18.70, shipping included. For Nikon the economics are less favorable. The cheapest M42 adapter I could find for Nikon that was both chipped and corrected to allow infinity focus was $56.30. Having tired of pointless frustrations, I bought it anyway.